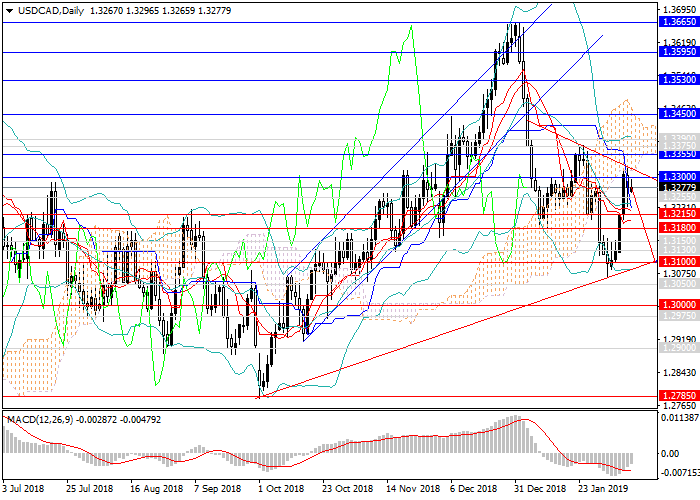 In early January, USD fell sharply against the Canadian dollar, losing more than 450 points in the first 10 days and reaching the level of 1.3180. Then the pair slightly adjusted upwards, after which the next downward wave was formed. Currently, the instrument is moving to a wide lateral consolidation: at the end of January and early February, the pair first dropped by 250 points, and then rose by the same 250 points. The main catalyst for this is the rapid growth of USD amid accelerating demand and the subsequent fall on weak labor market data and production orders. This week, one should focus on inflation data, retail sales, industrial production, and major indices. The main indicator for the US dollar is inflationary pressure, the growth or decrease of which directly affects the decision on interest rates and changes in monetary policy. A new downward wave with the target at 1.3100 is expected, after which the pair can recover to 1.3215, 1.3255. Indicators confirm the possible transition to lateral consolidation: MACD indicates a decline in the volume of short positions, and Bollinger Bands are arranged horizontally. Support levels: 1.3215, 1.3180, 1.3150, 1.3130, 1.3100, 1.3000, 1.2975, 1.2900. Resistance levels: 1.3300, 1.3355, 1.3375, 1.3390, 1.3450, 1.3530, 1.3595, 1.3665. Short positions may be opened from the current level with the target at 1.3100 and stop loss at 1.3330. BCS Forex clients are provided with daily analytical reviews and forex market forecasts from the leading experts with many years of successful trading experience. Competent forecasts allow you to realistically assess the situation on Forex market and identify potential risks, as well as emerging investment opportunities. At the heart of professional forecast is an expert opinion based on analysis and the latest trends of the world financial markets. To make forecasts, you need not only a comprehensive analysis of market fluctuations, but also experience in Forex. Our experts possess all the features required for predicting certain market quotations. Analysis of such experts is supported by years of successful trading operations and in-depth knowledge of the peculiarities of global financial markets.